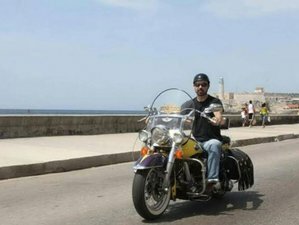 Ever dreamed of getting on a motorcycle and traveling through the breathtaking landscapes of Cuba? Hard Road House awaits you with its fleet of motorcycles and puts at your disposal this spectacular tour. If you like the Caribbean, this tour is perfect for you! Through this motorcycle tour, you can explore Cuba's jungle, tropical beaches, colonial cities, and the beautiful Havana. Join this tour and make your trip to Cuba an unforgettable one! Along the tour, you will be staying in three to four-star hotels or private houses arranged by Hard Road Guido Rene Rojas Leal. You will be staying for three nights in Havana, one night in Viñales, one night in Cienfuegos, two nights in Trinidad, and two nights in Varadero. This tour will take you to explore Cuba's most beautiful landscapes which include Havana, Viñales, Cienfuegos, Trinidad, and Varadero. Hard Road House offers unforgettable motorcycle tours, motorcycle rental services, and beautiful accommodations in Cuba, Argentina, and Chile. Please select your desired motorcycle type when sending an inquiry. The prices remain the same regardless of the motorcycle type you choose.